You know the story of Rumpelstiltskin? They got it wrong. It's really just a story about paying back a debt. So begins Miryem's story in Spinning Silver by Naomi Novik. In Litvas, a land with a constantly encroaching winter, Miryem's family is starving. Her father is the local moneylender, but he's so softhearted that he will never collect what he's owed. So Miryem takes over and finds out that she has a skill for moneylending and making deals. When her ability to take silver and turn it into gold attracts the nearby magic folk the Staryk, rulers of ice and snow, Miryem finds herself captured by the King of the Staryk in a bargain that means much more than she knows. So, Miryem is such a great, great character. She sees her family is in trouble and she takes matters into her own hands. She ends up not only saving them from starving, but building a comfortable life for them. Miryem is a lady with ambition. And, just as it does in so many cases, that ambition attracts some trouble. The townspeople are bitter that they can no longer get away with shirking their debts. And the Staryk see what she can do and want to capture that power for themselves. And that's just one part of the rich tapestry that is this fantasy novel. We also hear from Wanda, a local peasant girl who comes to work at Miryem's farm to pay off her father's debt. And Irina, a plain girl whose father is determined that she will marry the tsar, no matter how unlikely that seems at first. All of their fates are intertwined, though none of them know it at first, and how they're connected is slowly revealed as you read farther and father. This is a great summer read for when the temperatures are climbing. The magic land of ever-growing winter will have you shivering even as the heat index soars outside. This is a story of strong women who use their minds to solve problems and who refuse to settle for what society seems to want for them. There's a rich tapestry of magic here, too, and it's not always easy to see who the good guys are. If you like fairy tale retellings and fantasy that completely transports you to another place, pick up Spinning Silver. This book is published for adults, but I think there's a lot of teen crossover appeal, too. The Bear and the Nightingale by Katherine Arden (Del Ray, 2017). This is another rich, transporting fantasy novel that you can really sink your teeth into. It features a strong heroine and magic and a similarly cold and sweeping Russian-ish setting. Uprooted by Naomi Novik (Del Ray, 2015). Novik's previous standalone fantasy novel won a Nebula Award for best novel. Based on Polish fairy tales, this is another story with a strong heroine, a rich forested fantasy setting, and lots of crossover appeal for teens. East by Edith Pattou (Houghton Mifflin Harcourt, 2003). This fantasy novel is actually written for teens, but I think there's a lot of crossover potential for adults. This one is a retelling of the fairy tale East of the Sun and West of the Moon. Readers who like sussing out fairy tale retellings and strong girl characters will enjoy this one, too. 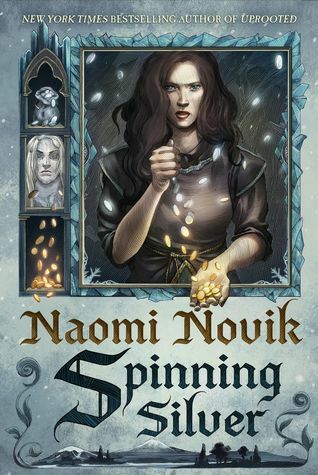 Spinning Silver by Naomi Novik (adult, with teen appeal). Del Rey, 2018. 448 pages. Reviewed from e-galley provided by publisher.